The Fourth » It’s gonna be a long day. Again. It’s gonna be a long day. Again. Christmas is over, so we now return you to our regularly scheduled people being jerks. Hey. There may not be a comic Friday, but there will be something. The reason is, Victor and I will be playing in the Armed Forces Bowl in Fort Worth. Playing football, of course! No, playing in the band. We’ll be gone for a few days. Yeah, he’s had a good night’s rest for once. And perhaps it’s the pajamas. He looks good in those pajamas. He really does. He should call himself a wizard and then just walk around in them everywhere. No one would notice that they’re actually bathrobes? Yeah, maybe it’s the mellow colors and relaxed fit of those pajamas that make him feel not so stressed out. It looks like Floyd may have as much fun as Davis! 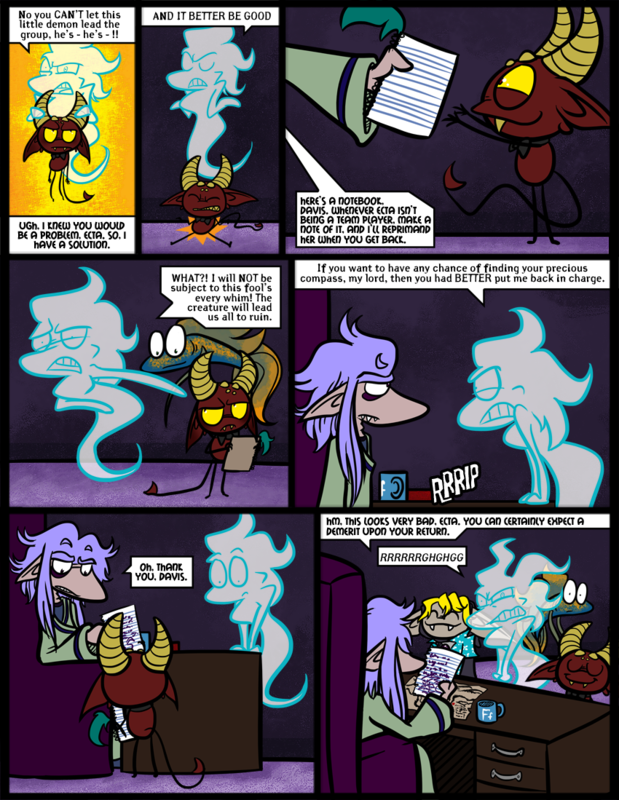 I feel bad for Ecta…I mean, she may be a jerk and extremely bossy, but at least she works hard and is loyal…and this is what she gets for that from Skarva? Tsk, tsk. That said, I do agree with Bartimaeus above me. It’s a touch mean to Ecta to be juggling around the command structure when she has worked both life and death (literally) to keep her position. That is dedication you probably want to move sideways instead of downwards, especially given she hasn’t really been looking upwards towards SKARVA’S position, she has been perfectly happy with her immediate management of her squad. But, hey, Skarva has a right to test if Davis has actual leadership skills. This joke kinda ruins Davis’ chances if the mission doesn’t go without a hitch, but it’s not like this group is utterly lacking initiative, they’ll try to get things done as quickly and efficiently as they can, albeit with lots of grumbling and a need to utilize red rage occasionally. Yeah, what exactly is going on in his mind is up for debate. But I like to think of it as a bit of a joke between Davis and Skärva too. 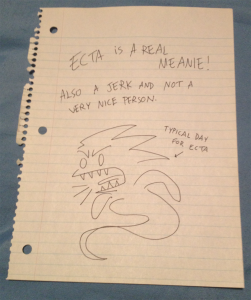 Ecta has no idea what’s written on that paper, but it’s clearly not meant to be taken too seriously. I mean, Ecta can’t exactly be gunning for Skärva’s *hereditary* position And she’s not exactly happy with her squad, although she is happy with that level of command – she just figures there are people harder-working than Floyd, more intelligent than Slice and less snarky than Davis. The highest position you could aim for would be Skärva’s assistant, but Derk’s quite irreplaceable for his own reasons… so Ecta’s doing about as good as she can. There is something special about this group indeed, something that Skärva has realized. They don’t exactly work like clockwork, but they have the right combination of personalities to get things done, as long as one of them doesn’t mess things up! Notice in the forest arc that their little quirks all came into play: Ecta’s fierce determination, Floyd’s ability to mediate, Davis’s manipulative cleverness and and even Slice’s tendency to talk to vegetables! I agree, but hugging a ghost is like hugging air if they don’t want it and hugging a cold mound of Jell-O if they do… and I’m pretty sure she doesn’t want it. – This development is both amusing and interesting! I had in mind a scientist in a labcoat, I think, but I prefer your idea and so declare it to be so! Alas, poor Davis was found with second- to third- degree rage burns; experts believe that it was an orange fury, with a few (generally dismissed) scientists insisting that Ecta had progressed through to the currently-theoretical “red fury” stage. Debate rages about whether a single entity could truly achieve the “red fury” stage; many believe that if it were to occur, it would ignite the tempers of all people in all of Idenau, and point to this as evidence that it has not happened. Most of the rest believe that these many are idiots. As for Davis, he was semi-conscious when found, and would only moan: “Eeectaaaa… Eectaaaa…” He is currently recovering in an undisclosed hospital (although journalists suspect that following a certain blue-and-gold flish, who has been seen travelling under a heavy cloak (even in broad daylight on a hot day), may reveal the answer).